12.5" RCOS @ ~f/9 (2880 mm fl) 1.28 arcsec / pixel. The Zoomify image scale is 1.28 to 3.20 arcsec / pixel. 20% Ha was added to the Red channel and 20% OIII to the blue. Click here for a narrowband color mapped version. CCDSoft, CCDStack, Photoshop CS w/ the Fits Liberator plugin. Noel Carboni's actions. eXcalibrator for (b-v), (v-r) color calibration, using 7 stars from the NOMAD1 database. 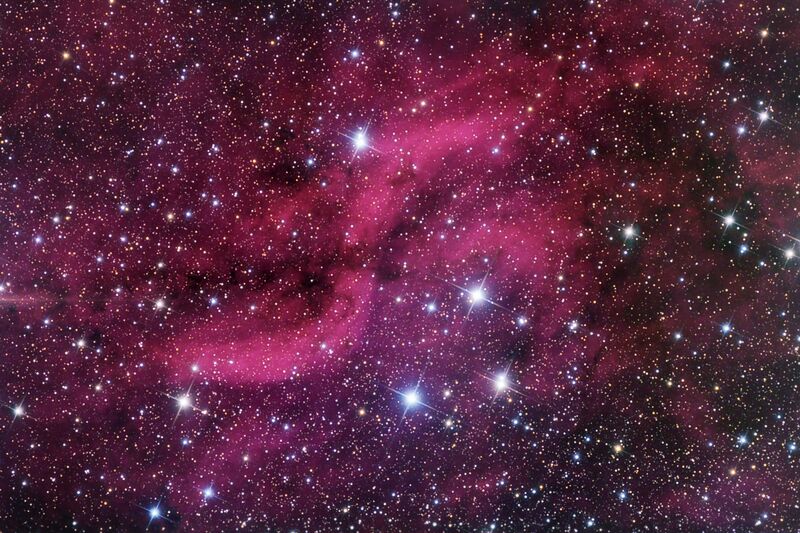 DWB-111, the Propeller Nebula, is an emission nebula in the constellation Cygnus. Astronomers seem to have more questions than answers, regarding this nebula. The origin of the peculiar structure is still completely unknown. The nebula's distance and source of excitation are also undetermined. DWB-111 mass is believed to be quite low, probably less than 50 solar masses. Obscuring dust is closely associated with the nebula, but seems to occur mostly in front of it.